Andrew Hood examines what has made this annual event in Australia so successful. 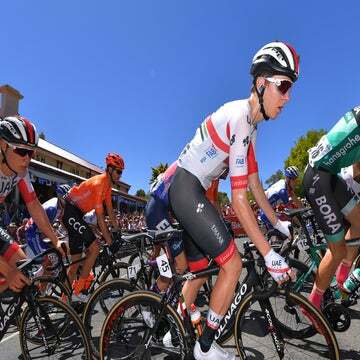 ADELAIDE, Australia (VN) — The Santos Tour Down Under ended with a bang Sunday atop the Old Willunga Hill. Thousands of fans lined Australia’s iconic climb, and Richie Porte delivered a crowd-pleasing stage victory while Australia’s own Mitchelton-Scott took the overall win. It was the perfect ending to another tremendous week of racing with a distinctive Australian flavor. This year marked the 21st edition of the race, something of a milestone for any bicycle race. Since its first edition in 1999, it has established itself as the premier race on the Oceania calendar and has grown into a favorite both among riders and fans alike. The big news this week is that Santos, an oil and gas company, signed on to continue its title sponsorship for three more years. As far as racing goes, the Tour Down Under is hard, but not too hard. With six stages, the average length is about 140 kilometers per day, a touch lower than most of the longer European races. That’s just fine for the peloton blowing out the cobwebs after a long winter. During its two decades, the race has gradually become more difficult. When it first started, sprinters like Stuart O’Grady and André Greipel could win the overall. In its early editions, it was too easy. Organizers have gradually added more difficulty. The Old Willunga Hill has been a mainstay — the race ended atop the climb this year — and other climbs such as Paracombe and the Corkscrew in the Adelaide Hills have been incorporated into the route. The racing conditions are generally ideal for the Tour Down Under. Held over the rolling Adelaide Hills and the wide-open valleys of Australia’s wine country at Barossa, it’s hard to find a pothole in the roads of South Australia. The occasional brush fire and scorching temperatures can be concerns and the thermometer often tops 100 degrees. That’s hot for any bike race, but the heat can be especially brutal for riders coming from the chill of the northern hemisphere. Many riders head down to Australia right after the Christmas holidays, in order to give their bodies an extra week or so to get used to the heat. Officials are quick to act if temperatures get too extreme. In fact, this year’s race saw the first two stages trimmed due to the extreme weather protocol. Nearly everyone agrees that the TDU runs a tight ship. It’s rare that there’s a race glitch and everything runs like clockwork. It helps that the race isn’t a point-to-point stage race, which takes the logistical challenge to another level. Instead, the Tour Down Under is unique in that it features a central hub, where teams have a base of operation during the week to work on bikes and store vehicles and equipment. Riders sleep in the same hotel each night and there are not hours-long transfers. Turtur announced he would step down as race director Monday after founding the race in 1999. There’s no word on who might replace him, but the foundation of the race is sound. Riders enjoy coming back to the same hotel every night. Without team buses during the week, riders often ride back to central Adelaide after each stage finish to add some extra time on the bike (and beat the traffic). Riders often bring along family and friends, and extend the trip into a mix of vacation and training camp. Jumbo-Visma’s Robert Gesink brought his wife and kids last year for a month-long stay in Australia. How many races have its own theme song? The Tour Down Under does. The TDU is more than a bike race and the event quickly positioned itself as a destination among Australia’s avid cycling community. Located right smack during the school holidays — remember, it’s summer time down here — each day’s course sees pretty good crowds, especially on the climbs and start and finish areas. Thousands of Aussie fans pour into Adelaide from Sydney, Melbourne and overseas. Race officials estimated that 45,000 fans visit the region during the week. More than 2,000 cyclists participate in a fan ride held during the Tour Down Under. A race village right in downtown Adelaide attracts a mix of fans with nightly activities, big-screen TVs, beer gardens, a mobile velodrome, and live music. That combo of great weather, tough racing and quality facilities drew EF-Education First’s Michael Woods, who came down to Australia in late December and rented an AirBnB house as a base of operation. Woods will stay on for the Cadel Evans Great Ocean Race as well as the Herald Sun Tour into early February. The event has deep institutional support among local politicians and communities. Local towns embrace the race and create street parties throughout the week. The race tapped into the thriving racing scene in Adelaide. Many top pros, including Stuart O’Grady and Rohan Dennis, live here. And the race has helped Adelaide gain some bragging rights in its ongoing rivalry with Sydney and Melbourne. The Tour Down Under has grown into an exemplary event that many in Europe and beyond could learn from. After two decades, the race has reached a maturity that should keep it a fan and rider favorite for years.